So, I cheated a bit on this week’s blog. But it’s ok, because I am giving full credit to the writer (Stephanie Sisco) of this great article (“10 Habits of Highly Organized People”) in my favorite magazine (Real Simple). I really like these practical suggestions. Though I am far from perfectly organized, I wouldn’t be running a professional organizing company if I didn’t feel confident that I was a pretty good example! I want to highlight a few of the habits mentioned in this article because they have been particularly helpful to me. “Trick yourself with treats: Attach a reward to a tedious task.” I do this just about every day! Here’s today’s trick: I can’t get on Pinterest to look for ideas for a shower I’m hosting until I update my spreadsheet of business expenses. “Organized people spend 30 seconds now to save hours later.” Can I get an “Amen!” for this one? I know it’s tempting when you get home exhausted holding a pile of things to just set them down and collapse on the sofa. But resist the temptation to put them up later. Because that pile of things will keep growing. And growing. And the next thing you know, you’re spending hours on it when if you had just taken that little bit of time to put those things away, you’d never have gotten yourself into that mess. If you don’t know much about professional organizing, you might be wondering whether hiring an organizer is something that could benefit you. Here’s an easy quiz to find out if you could benefit from hiring me to help you at your home or business. Are you hesitant to invite people to your house because of the mess? Do you have to close off certain areas of the house when guests are present because you don’t want them to see the mess? Is there a room or closet or other area of your house that you cringe to look at because it is so out of control? Do you waste a lot of time looking for things? Is your garage so full of stuff that you can’t park one or both cars in it? Are you preparing for a move or have you recently moved but still haven’t completely unpacked? Are you so overwhelmed with your stuff that you don’t even know where to begin? Do you know there is so much that needs to be done to bring order to your space, but you simply don’t have the time to get it done? Do you have so much stuff that you have to rent storage space, but you really don’t want to anymore? If you answered “Yes” to any of these questions, I can help you! Check out my website (www.beshipshape.com) to find out how I work and see before and after pictures of a few of my projects. Then call me (423-567-4273), email me (beshipshape@gmail.com), or send me a message on Facebook (facebook.com/beshipshape), and let’s get started! I’m a sucker for a great quote. But for several years, when I would read inspirational quotes like the ones above, I would cringe just a little because I knew that I had a dream I wanted to pursue, but I was too afraid to take that first step. Today is especially significant for me, because it officially marks the public declaration of finally taking that step. Don’t get me wrong. It’s not as if I’ve been sitting around doing nothing my whole life. I’ve played a lot of very fulfilling roles thus far: daughter, wife, mother, college athlete, pediatric physician assistant, elementary school instructional assistant, homeroom mom, clinic volunteer, community theatre actress, etc. But what I have always loved to do more than anything else is to organize. Bringing order to a closet or pantry or garage or desk or schedule or just about anything is what I do best. Several years ago, I learned that there are people who make a living helping people organize. I knew that professional organizing was something I would be good at and would enjoy. After years of contemplating this career move, the timing is finally right! I have been hard at work reading, job shadowing with experienced organizer Mary Panciewicz, taking online classes with the National Association of Professional Organizers (NAPO), getting coaching and advice from Aundrea Wilcox at the Kingsport Office of Small Business Entrepreneurs (KOSBE) at the Kingsport Chamber of Commerce and Kathy Richards with AdviCoach, working with Lesa Phillips of Sterling Graphics to design a logo and business cards, working with my husband Eric to design my website, organizing for test clients, securing licenses and insurance, and all the myriad of details that go along with a small business launch. 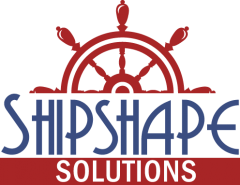 Shipshape Solutions is now officially launched! Thanks for joining me on this new adventure! If you’re reading this on my personal Facebook page, please visit the Facebook page for Shipshape Solutions at facebook.com/beshipshape and please “Like” my page to stay informed. My website beshipshape.com will tell you everything you need to know about the professional organizing services I offer for your home or business. You can also connect with me on Twitter @beshipshape. If you’re on my website, you’ll find information about the different services I provide under the menu tab Services. Under Success Stories, you’ll find Testimonials (recommendations from my clients) and Past Projects (descriptions and before/after pictures of a few of my organizing projects). Under the tab About, you’ll find my bio and a link to my Client Agreement and Photo Consent form. Click on the FAQ tab for answers to most any question you could have about how I work as an organizer. To sign up for emails and my blog (which will contain organizing tips, special offers and more) or to send me a message, click on the Contact tab. The Blog tab will show my blog entries, which will be updated weekly. Are you ready to finally get organized? Contact me, and let’s get started!